The communicating control is designed exclusively for our Infinity system products and is the brains behind our ultra-efficient Greenspeed™ intelligence systems. Lastly, there's energy management and remote access features. 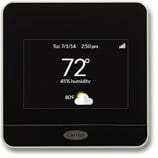 The CôrTM thermostat is designed to combine home comfort with reduced energy use. It saves an average of 20% on heating and cooling energy costs. It’s what we call the heart of a smarter home. 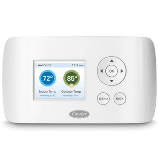 The ComfortZone thermostat allows you to program temperature and humidity levels in 7 independent day cycles, with options for 2, 4, or 8 zones. A single zone includes room sensors, equipment controllers, and outdoor air and duct temperature sensors.